And what, pray tell, did page 10 have to say . . . ? By S. PAUL VARGA • The Royal Engineers'contribution to the colony during their short stint here was immense. Mention red serge and the opening up of Western Canada in the same sentence and the image that automatically springs to mind is that of a Mountie, sitting astride his horse ready to make the wilderness safe from crime. Now it's time for a history lesson. Long before the North West Mounted Police came on the scene (the original name of the Royal Canadian Mounted Police), there were the Royal Engineers. According to those in the know — historians, mostly — the engineers did more in a few short years to bring civilization to the colonies of New Caledonia and Vancouver Island than the RCMP ever did. Todd Birch is working to change that perception. The Merritt resident and amateur military historian is a member of a loosely formed group of people travelling the province in authentic period dress, with authentic period armaments, and authentic period accoutrements, informing British Columbians and visitors to the province about their history. Taking on the persona of Sgt. John McMurphy, the actual name of one of the Royal Engineers who served in British Columbia in 1862, Birch tends to his weapons and his duties much like McMurphy would have done. And when a member of the public from the 21st century intrudes upon the British Columbia of the 19th century, Birch is polite and answers any questions. Providing a living, breathing example of what life, and hard work, was like for the men in the Royal Engineers is the best way to educate the public about the valuable role these members of the British Military performed. But according to Birch, the ones who need the most education are those who live here. "Canadians are the worst ones when it comes to knowledge about their own country," says Birch. "They see the red tunic and automatically say 'RCMP.' I turn around and say: 'And who would you be talking about?'" While staying in character, Birch gently prompts people to understand the Royal Engineers of 1862 had no knowledge of the RCMP for the simple reason the paramilitary organization had not yet been formed. The Royal Engineers, like much of the British Army, wore red — a style the RCMP borrowed when it was formed a decade later. The accomplishments of the Royal Engineers in British Columbia are many, from protecting the colonists from the American hordes to the south, to providing an official presence of the Queen, but undoubtedly their greatest contribution to the colony came from doing what they did best — building roads. Building the most dangerous stretches of the Cariboo Wagon Road to the goldfields of the new colony, to be specific. Then there's the intangible contributions of the engineers, such as the ones made to the fabric of society of their day. Sgt. James Lindsay (ably portrayed by Tim Watkins from Maple Ridge) went back to England in 1863 where he finished his 21 years of service to the queen, but returned later to become the Chief Constable of the Cariboo and the sheriff at Barkerville, where he is buried. As a member of the Royal Artillery assigned to the engineers, Lindsay is one of the few military members of the group not wearing red, but he has the most colourful nickname: Whispering Jimmy, so named for his rather talkative nature, especially when he'd imbibed perhaps a bit too much. After his service to the Crown had been discharged, McMurphy remained in British Columbia, as did Capt. Henry Luard (portrayed by Simon Sherwood). 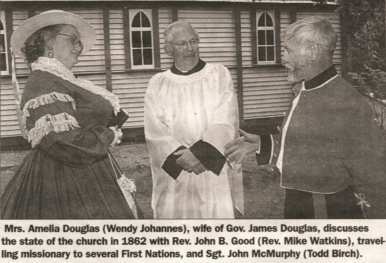 They married, settled down, raised families, and helped populate the province, all before the colony had joined Confederation. A fascination with military history is what attracted Birch to joining the group of historical re-enacters, but Sherwood is quick to point out it's almost like they joined him. He explains Sherwood and John Harper (portraying Dr. J. Vernon Seddall) met while providing historical material on the set of Hawkeye, a television show being filmed in Vancouver — they later brought their colourful passion for history to life. 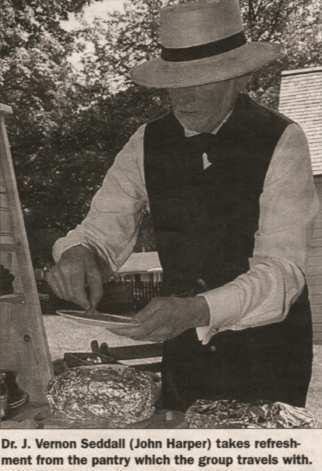 David Funk, who portrays land surveyor and early entrepreneur Joseph Dispard Pemberton, can be seen in the movie Gunfighter's Moon playing the violin. Later, when Birch found out about the group, he joined immediately as the Nicola Valley resident had previously attempted to form a group on his own. "With all due deference to Sgt. McMurphy," says Sherwood, speaking in character. "McMurphy tried to form the company 16 years before this group organized." On the Canada Day weekend the royal engineers were in Barkerville, re-enacting their role in the development of Barkerville, and have previously been in Victoria at the Fort Rodd Hill artillery battery. Soon they'll head to the San Juan Islands to provide a royal engineers presence at the infamous Pig War, settled without a shot having been fired when the current border was drawn between Canada and the United States. It's the Canada Day weekend — correction, Dominion Day holiday — that is one of the special occasions for the group. It's a time when Canadians pay particular attention to all things Canadian and the engineers can get their message across; as a result, the royal engineer re-enacters pay particular attention to the details. Photographer Francis Claudet (Stewart Goodin) planned on travelling to Barkerville with his tailboard camera (so named because it would fit on the tailboard of a wagon.) The working model of an ambrotype camera creates photographs on glass plates, using a collodion wet plate system that was developed only a decade earlier (in 1851). It requires Claudet to transport a darkroom with the camera and necessitates photographic subjects to remain motionless for approximately half an hour, but he says the wet plate process was used right up to the 1920s — he has glass plates depicting the Tulameen area taken in the 1890s. "I'm one of seven photographers in North America that are still able to do the wet plate process," says Goodin, stepping out of character for a moment. "Being able to understand how the process works means we're able to understand why nobody appears to be smiling in the photographs — they couldn't hold the exact same smile for the entire length of up to a 30-minute exposure." But while the group members are large in their dedication, they are still small in number. Any opportunity to meet with someone interested in joining the group is immediately treated like royalty — though the role of queen's representative is already taken (Wendy Johannes portrays Mrs. Amelia Douglas, wife of Governor Sir James Douglas). During the group's short stay in Yale, Rev. Mike Watkins from St. Michael's Anglican Church in Merritt dropped by to help re-dedicate the historic Yale church. Watkins travels to a number of churches in the area much like a travelling preacher would have done in the 1860s, and was immediately asked if he would like to attend one or two functions a year as the local reverend. For more information on the historical re-enactment of the Royal Engineers, or on the history of the engineers, contact Todd Birch at 378-0822.